After a really brutal winter and more snow than I hope to ever see again, spring is finally here. These tiny little white flowers grow in drifts in my yard each spring. The blossoms are only about 1/4 inch across. In this area, they are called "piss-a-bits" but I wonder if they have different name. Do you know what they are? 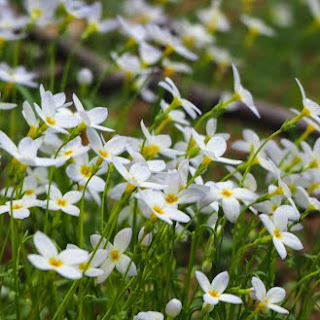 I have just been told that these are called Bluets. Thanks, Diane!